SXSW Interactive, the ultimate digital event of the year, kicks off this weekend in Austin, Texas. Each year the festival has grown by leaps and bounds, with more presentations, parties and networking opportunities than any one person can experience. As an attendee, it’s easy to get overwhelmed. 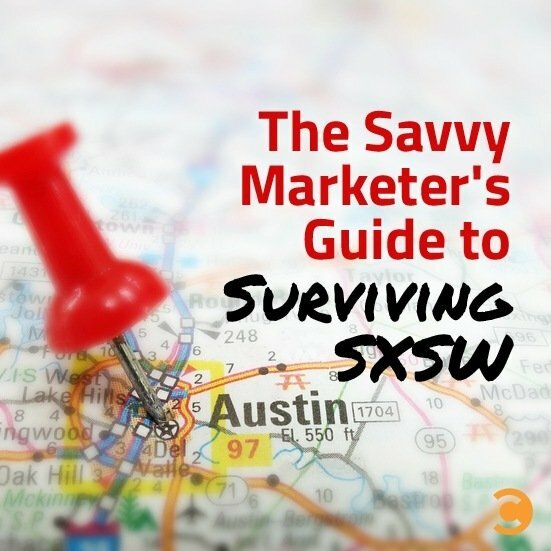 No matter how many times you’ve been to the jungle called SXSW, these tips from the Convince & Convert team will help you climb to the top of the food chain. shI can’t make it this year myself (spring break with the kids), but I have so many fond (if hazy) memories of SXSW, including the debut of my first book – The NOW Revolution – with Amber Naslund; AllHat parties with Richard Binhammer; a great duo presentation with Joe Pulizzi; and an amazing concert featuring a flaming theramin. Set your game plan in advance by utilizing the SXSW Schedule online, (http://schedule.sxsw.com) and downloading the SXSW GO Official Mobile App. Sign up for one “SXSW for beginners” event when you get there; it’s pretty helpful to just give you a sense of the activities. Don’t schedule time to go on the exhibitor floor, but if you end up not being able to get into an event (which is bound to happen), use that time to visit. Pack for every occasion, but pay careful attention to your shoes. You’ll take more steps than the average New Yorker each day (and night!). Gel inserts may save your feet after day one. Get to all sessions EARLY. Most will be at capacity and you will get shut out. Try to attend a few panels that are outside your core interests but are intriguing. There are over 1,000 events over the course of SXSW Interactive, so finding something new won’t be hard. Don’t bother with big sessions from famous people. You can follow those on Twitter or watch later on YouTube (https://www.youtube.com/user/sxsw). Stick with the smaller, more focused topics. If you do want to see a famous person speak, be at the venue an hour in advance. Big name talks will fill up easily 45 min ahead of time. Plan your itinerary according to where you are based. The main events are at the convention center, but the other hotel venues are sometimes a bigger schlep than they look on a map. Try to find a venue that you like and stick with it. Minimize venue hopping (during the day for sessions and during the night for parties) if at all possible. Select more than one event to attend for every spot; events sometimes fill up inconsistently and unpredictably. Talk to strangers. This is an interactive event, after all! Do not expect cabs and ride-sharing to be available readily. Trying to hail a cab after 6pm is a blood sport. Be forewarned that the going rate for an Uber black car is hundreds of dollars an hour during SXSW. Lyft Lines may be available this year, but require you to share rides with others in the line. Rent a car, unless you are staying in the city center. Public transit has limited hours of operation and public buses get diverted during the convention, so looking up directions on your phone isn’t always accurate. There are garages both on Cesar Chavez near the convention center and also across the river. There are usually free bikes to borrow near Red River Road and Cesar Chavez. Have a charger and/or battery pack; there are charging stations, but it can be a hassle to get to one that’s not full. Better yet, pack a power strip or two and make friends with fellow battery-starved attendees. Do not waste time sitting down to eat unless it’s with a client, prospective clients, or someone truly awesome. Eat on the run and maximize time for sessions. There’s a lot of free food at sponsored spaces that aren’t official venues. Last year, Yahoo, Nest, and Subway had free food and snacks every day at pop-up locations. Lots of food and pop ups are along Red River Road. Keep a water bottle handy. Water stations are plentiful (and free!). At night, be thinking several moves ahead with where you want to go and how you plan to get there. Don’t bother heading to a party without an RSVP. If lines are long, chat up the doormen to see if lines are moving and if you’ll have a chance to even get in that night. If multiple people are going from your company or agency, don’t stick together too much. It reduces your chances of kismet and awesomeness. Split up, and then reconvene and end of day. Phone/wifi signal can be spotty because of the sheer number of people on it. Make plans in advance about where/when you’ll reconnect with friends.